Product code: ES6746 Categories: Sold Items, Sold Rings. 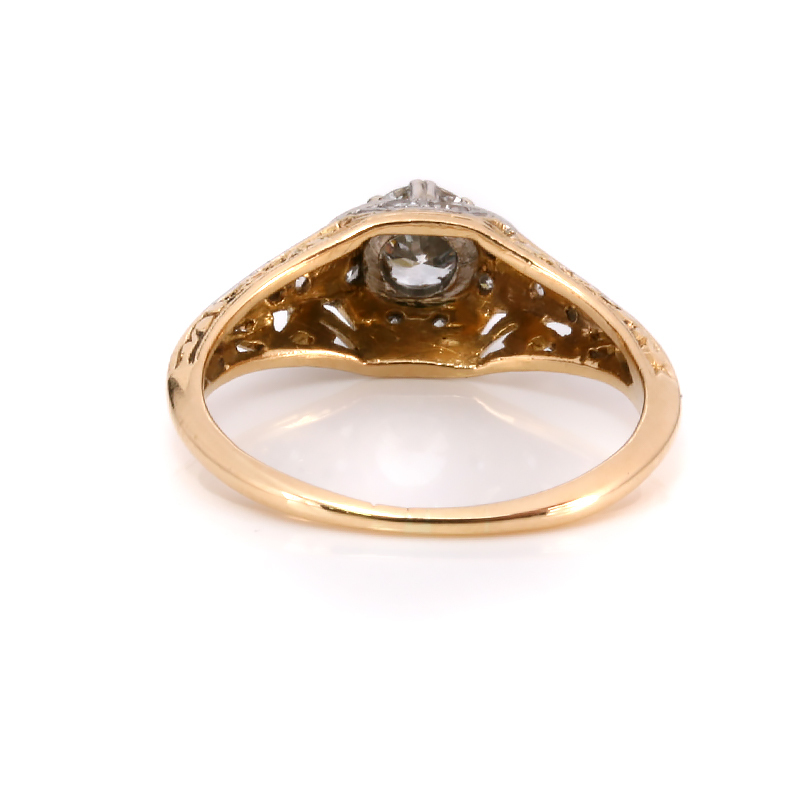 Exquisitely hand made in 18ct yellow gold and platinum, this Art Deco diamond engagement ring from the 1920’s shows so much detail and character and is destined to be loved and cherished by the lucky woman who will wear this. Art Deco engagement rings of the 1920’s to the 1940’s have never gone out of fashion or style and remain our most poplar and sought after era of engagement ring, and when you see the beautiful detail that has gone into making this ring it will become apparent why. In the centre there is a 0.38 carat early brilliant cut diamond that is G in colour and VS in clarity and then on each side are two diamonds that add extra sparkle to the centre diamond, then down each shoulder are another two diamonds. Then as if this wasn’t enough, on the other side of the ring are a further two more diamonds set amongst the most beautiful and captivating scroll work that adds so much charm and character to an already exquisite ring. These additional diamonds total 0.12 carats and really compliment the ring so well and add the right amount of sparkle. From all sides and angles, this is one of the most breathtaking examples of an Art Deco diamond engagement ring that you could ever hope for. Tags: Art Deco Diamond Ring, Art Deco Engagement Ring, Art Deco Ring. The Art Deco period was between the 1920’s to the 1940’s and was as popular today in style and design as when they were made all those years ago. Commonly made in gold or platinum or a combination of both, platinum was very popular during this period as it is a very pure white metal that is wonderful to work with to obtain very fine intricate detail. With a combination of older cut diamonds re-set into rings or the “newer” round brilliant cut diamond that was being perfected in the early 20th century, the use of other gemstones such as rubies and sapphires is also commonly seen in many Art Deco engagement rings. Quite often Art Deco jewellery including engagement rings, display a wonderful geometric symmetry that has never gone out of fashion and is a characteristic of many Art Deco engagement rings which can be seen in this Art Deco diamond engagement ring from the 1920’s.